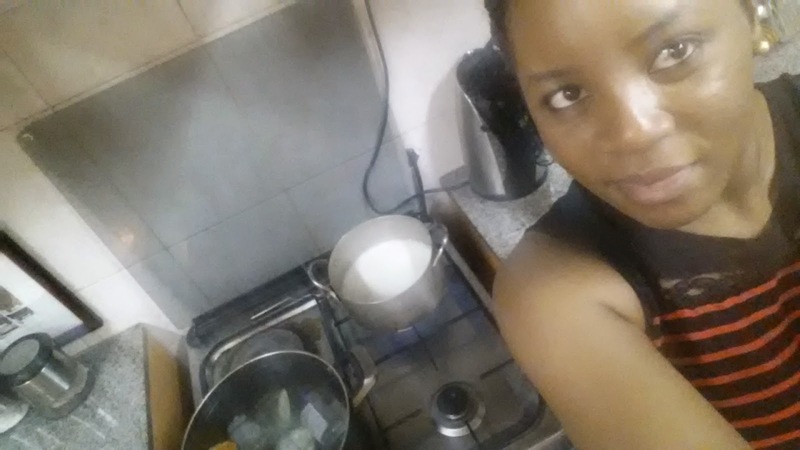 Reader Post: How to make Greek yoghurt, by Dooshima. I was excited when Doosh told me she was making some Greek yoghurt at home, I haven't even tried making some myself because I buy from a store close to my house, I just 'step-hop' to the place. Hmmm, i've been lazy. I will definitely take her guidelines and make some for myself. Please enjoy. 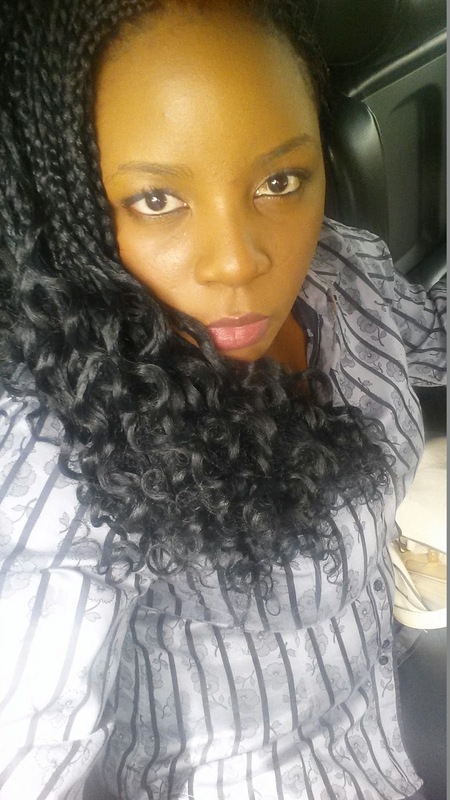 P.S: Dooshima, is a long time reader of this blog, beautiful lady. Muslin or Cheesecloth. If none available use an old T-shirt or kitchen towel. Wash your jars thoroughly and place them in a pot with their covers. 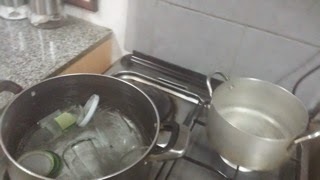 Add water to pot until jars are covered and place on fire to boil. When the water in the pot begins to boil, reduce the heat and leave the pot and jars on fire until you are ready to pour the milk in. Now you have to scald/pasteurize your milk. This means pouring the packet of milk into your saucepan and, over high heat, bring it almost to a boil. 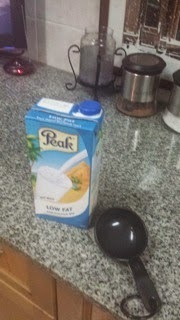 This will take about 3 minutes if the milk is at room temperature or 5-7 minutes if it’s just out of the fridge. 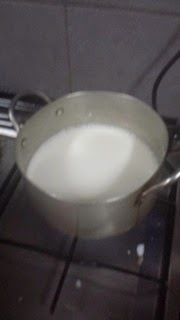 As the milk is just starting to bubble around the edges of the saucepan, remove from the burner. Put a lid on the pan if you want, and then leave to cool for 5-10 minutes. The milk is cool enough when you can put your fingertip on the side of the pot used without burning yourself. I used part of this as an active culture for the new batch. Add 4 tablespoons of yoghurt to the milk and mix. Carefully take glass jars out of the boiling hot water and pour milk mixture into them and close tightly immediately. Now it is time to leave the mixture to set. The best way to do this is by placing the jars in your oven and leaving the pilot light on. If you do not have an oven, you could place the jars in a kitchen cupboard and close. It is best to Follow steps 1-3 in the evening or just before bedtime so the yoghurt can set over night. This is the last and final step. By the time you wake up in the morning, the yoghurt will have set. a way to test this is if you shake the jar, you will notice the liquid inside is now very thick. You have successfully made yoghurt if you followed the preceding steps correctly. Now you get to make greek yogurt. Take the cloth that you have designated for the straining–tee-shirt, tea towel, or cheese cloth–stretch it over top of a sieve on a bowl. Pour yoghurt into the cloth and tie it. Place the bowl and suspended yogurt into the refrigerator. Let the yogurt drain for a couple of hours. The longer you let it drain the thicker the yogurt. When the yogurt has drained long enough, or when you remember that you forgot about it go to the fridge and remove the delicious ready to eat greek yoghurt. Avoid submerging the yogurt in all that delicious whey you’ve drained off. Put the yogurt in an air tight container and refrigerate until you want to eat it. Once you have made this recipe...for your next batch all you need to do is keep 4 tablespoons of this greek yoghurt to start the process again. Since first trying out this recipe 3 weeks ago...I have made it again twice. once I notice what I have made is about to finish..I keep the last 4 spoons to make another batch. 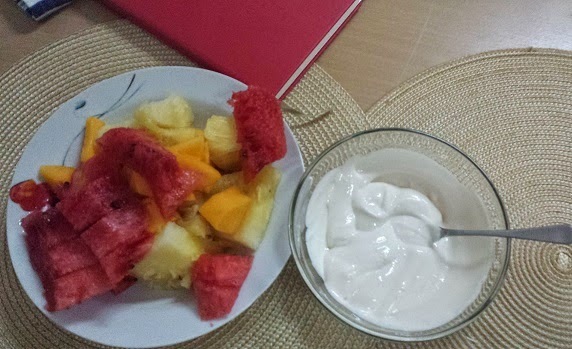 Yoghurt ready, with some fruits! Greek yoghurt is basically strained yoghurt. This process gives it a higher protein level, less sugar and carbohydrates than normal yoghurt making it super healthy. Enjoy it with fruits, nuts, plain in smoothies or as a replacement for cream in salad dressing. Thanks Doosh! Please sweets, if you have any great recipe to share, feel free to contact me on chelizruby@gmail.com I would love to share and learn from you. God bless. Hmmm nice... I've never really bn a fan of yogurt. Bcos of how much Cheliz talks abt it... I went to a store to buy some low fat ones.. Didn't see. Guess I can now make myself... Tnks dooshima.... Amanda. Amanda i love yoghurt no be lie. I will try making mine tmrw. Cant't wait! 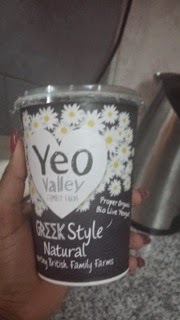 I love greek yoghurt and I can't seem to find any in Lagos supermarkets. I'm glad there's a DIY method. Two questions: Can you use any nigerian made yoghurt as the culture? Can we have a picture of how to suspend the yoghurt in the bowl? In fact, a step by step pictorial would greatly help. I can't wait to try this! Please cheliz what stores in lagos can I buy yogurt with probiotics or biolive yogurt? Thanks. Lool!! See case o! U want me to do free advert ni? Oya mail me so i can give u the name. If only u were on my food blog, plenty buying info there. :( I know o. I am saving to join the food blog. I will soon by Gods grace.